Hmm. I think maybe Garrison Keillor has been spending too many lonely nights up at Lake Wobegon or, perhaps I just need to find a different farm stand to buy corn from next summer. But, without going quite as far as Mr. Keillor, I will admit that there is something special about fresh sweet corn, prepared the day it was picked and eaten outdoors with friends and family, good barbecue and just a few wasps buzzing around to remind you that nothing this side of heaven is perfect. I don’t know who buys the “fresh” corn available right now in those little cellophane-wrapped packages of anemic, plasticky cobs, which were definitely not picked today or yesterday or, maybe not even last week. Desperately lonely people, I suppose, if Mr. Keillor’s hypothesis is to be believed. Now that I think of it, she sounds a little bit like Garrison Keillor. Let the corn defrost in a colander for about half an hour, rinsing and tossing occasionally. Heat a large cast iron pan over medium high heat and melt the butter. Add the corn and, stirring frequently, cook for about 10 minutes until corn is golden brown. Stir in mint, season with salt and pepper and serve hot. Enjoy. This entry was posted in Sides, Vegetables and tagged corn, frozen corn, Garrison Keillor, mint, side dish, The Wednesday Chef. Bookmark the permalink. I loved this when I made it too! So easy but somehow more than the sum of its parts. I agree. Couldn’t believe it was frozen corn! 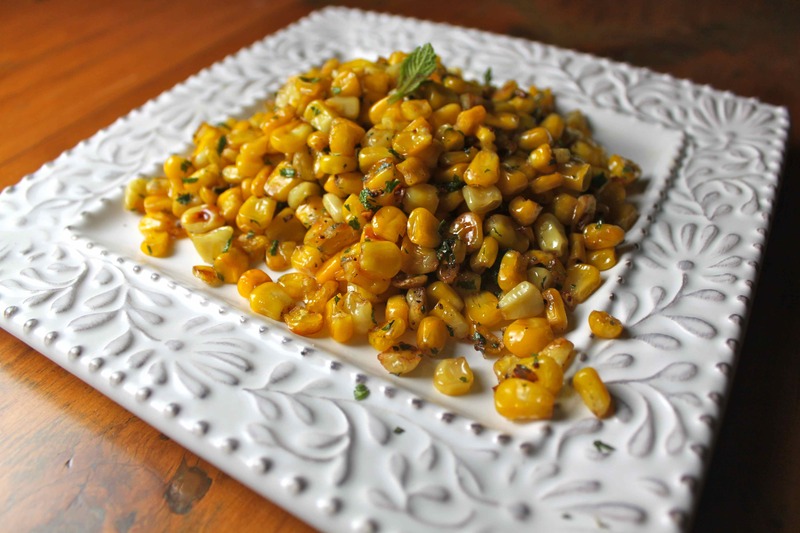 Mint + butter + corn = a trifecta of sorts moving appetites of all kinds. I also like corn + butter + ground toasted cumin. Yum, going to try the toasted cumin. Yum. Simple and savory, and easily vegan-adaptable!